This 300W Sunshine Flexible Solar Power Narrowboat Kit offers outstanding performance and great value for money. With this 300 Watt solar power kit you could expect to generate around 100 amps per day (12V Battery System) or 50 amps per day (24V Battery System) during the summer months supplementing the leisure battery power onboard. Whether you are on a liveaboard, day cruising or on the high seas you can rely on Sunshine Solar Panels to keep your batteries in a healthy condition at all times. 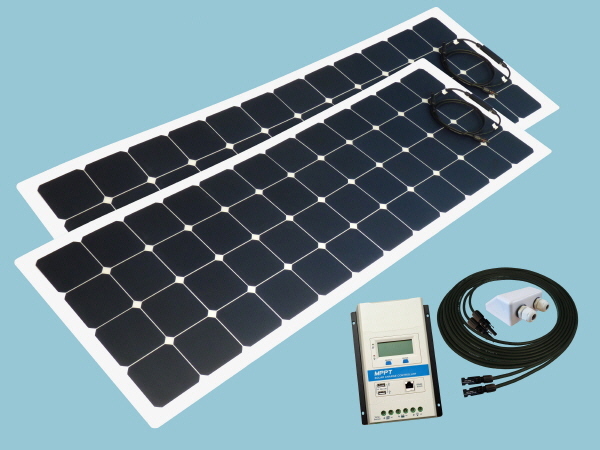 This Sunshine Solar Flexible Narrowboat Kit can be used to charge and maintain 12 volt or 24 volt battery banks. Included in the kit is a MPPT battery charge controller which can increase the efficiency of PV modules by 10% to 30%, in short making the most of the daylight hours. The Sunshine Flexible Solar range benefit from being thin, light and unbreakable. Light weight design combined with high efficiency cells and a 20°- 30° solar panel flexibility makes our flexible solar range perfect for boating applications. If you are a competent DIYer this kit has everything you need and also includes extra cable connectors so you can shorten the solar panels cable if needed and fit new connectors to suit your individual requirements. If you require the services of an installer please contact our Customer Services on 01508 488188. Save Money..... Don't forget you can save money on add-ons to compliment your solar kit such as the Remote Meter, not only does this give you valuable data about the overall performance of your solar panel it also gives you info on your battery state of charge and makes setting up your system easier. You may also wish to add some Bostik-360 Fixing Adhesive at a reduced price for bonding the solar panel and cable entry cover.